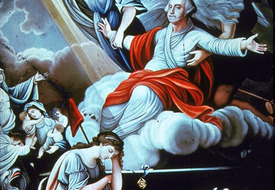 Card Text: "Apotheosis of George Washington," 19th century, watercolor on glass. 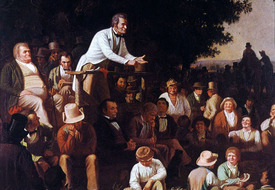 Card Text: Unidentified artist, "George Washington Giving the Laws"
Card Text: George Caleb Bingham, "Stump Speaking," 1853-54, detail, oil on canvas, 108 x 147.3 cm. Citation: Courtesy of The St. Louis Art Museum, 1 Fine Arts Dr, Forest Park, St. Louis, MO 63110. All rights reserved. We are grateful for the generosity of the St. Louis Art Museum. 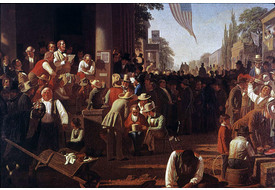 Card Text: George Caleb Bingham, "The Verdict of the People," 1854-5, oil on canvas, 42 ½ x 58 in. Citation: Courtesy of The St. Louis Art Museum, 1 Fine Arts Dr, St. Louis, MO 63110. All rights reserved. Our thanks to the Museum. 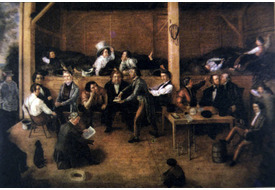 Card Text: Courtroom scene of early America, 1849, an informal, "frolicking time." A. Wighe, "Trial by Jury," painting. 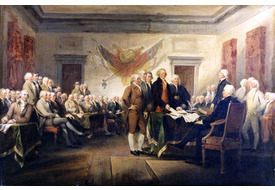 Citation: ASK Copyright © Museum of Art, Rhode Island School of Design, 224 Benefit St, Providence, RI 02903. Gift of Edith Jackson Green and Ellis Jackson. All rights reserved. 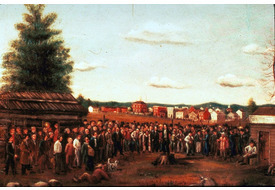 Card Text: Theophilus Adam Wylie, "Political Scene [Meeting] in Early Bloomington," 1837. Card Text: "Congressional pugilists," a heated partisan debate, cartoon, 1798. 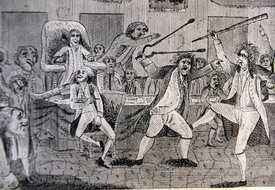 A fight on the floor of Congress between Vermont Representative Matthew Lyon, a Jeffersonian Republican, and Roger Griswold of Connecticut, a Federalist. "Griswold had accused Lyon of cowardice during the American Revolution and Lyon responded by spitting tobacco juice in Griswold's face." The interior of Congress Hall is shown. Several others look on as Griswold, armed with a cane, kicks Lyon, who grasps his arm and raises a pair of fireplace tongs to strike him. Below are the verses: "He in a trice struck Lyon thrice / Upon his head, enrag'd sir, / Who seiz'd the tongs to ease his wrongs, / And Griswold thus engag'd, sir." 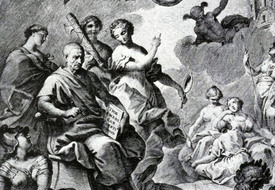 Print, 1798, Philadelphia. Citation: Library of Congress Prints and Photographs Division, Washington, DC 20540. LC-DIG-ppmsca-15707. 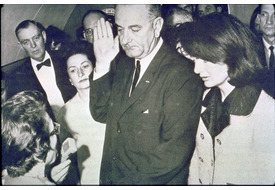 Card Text: Lyndon Johnson taking the oath of office in the airplane, flanked by Lady Bird and Jacqueline Kennedy. The swearing in was performed by Federal District Judge Sarah T. Hughes of Dallas. Johnson was President of the U.S. when he landed in the capital. Citation: Cecil Stoughton photo. Courtesy Lyndon Baines Johnson Library and Museum, 2313 Red River St., Austin, TX 78705. 1A-1-WH63. In Paul K. Conkin & David Burner, A History of Recent America, 1974, p. 569.